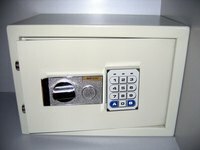 Safes are a reliable way to protect your most prized possessions in the event of a burglary or fire. Without having the proper access method, most modern safes are very hard to crack, even with specialized tools. Safes come in many styles and sizes, but all have three basic parts. The body of the safe is the exterior surface. This surface is usually thick steel or another type of hard and heavy metal. The body of the safe provides the most protection to the contents inside. It also adds weight to the safe to make it more difficult to pick up or move. Most safe bodies are impervious to bullets, fire and even explosive devices. By using metals with low-heat conductivity, modern manufacturers can guarantee protection of important valuables for up to four hours in 2,000 degree Fahrenheit direct flame. Most safe doors are of equal thickness to the body. They operate on swinging doors with internal hinges. Some doors swing out from the side. Some open from the top like a treasure chest. These doors are most often composed of metal just like the body and add weight to the safe. Doors with a tight fit and airtight seal along with a low-heat conductivity provide complete fireproof protection. There are many types of locking mechanisms, but all true safes have at least one. The lock is simply a rod or multiple rods of metal that prevent the door from opening. Locks prevent the door from opening by driving these metal rods into the safe body. The most common is a combination-style spinning tumbler that requires the correct clockwise and counter-clockwise turns to disengage the lock. Locks are also controlled by advanced technologies such as digital combinations, fingerprint scanning and retinal scanning. Even with the level of sophistication in lock styles, the locking mechanism is the weakest point of entry for most safes.